Conroys Pty Ltd (Conroys) has paid a penalty of $10,200 following the issue of an infringement notice by the Australian Competition and Consumer Commission . 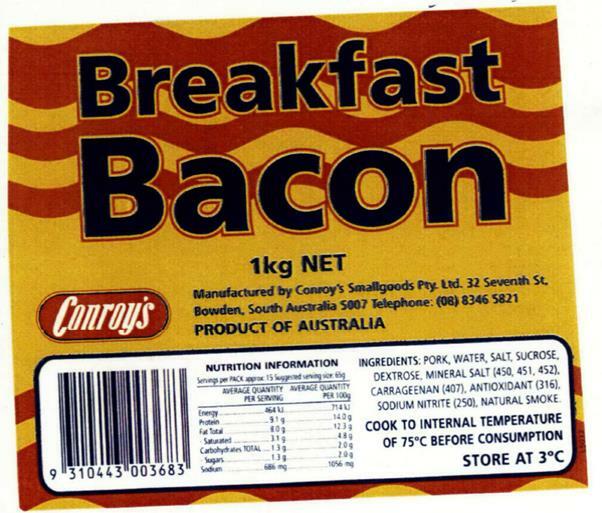 The ACCC issued the infringement notice because it had reasonable grounds to believe that Conroys made a false or misleading representation about the place of origin of its Breakfast Bacon – 1kg (the Bacon Product) in contravention of the Australian Consumer Law (ACL). In February 2015, Conroys supplied the Bacon Product labelled as a ‘Product of Australia’ when in fact it was produced using imported pig meat. The Bacon Product was supplied in a one-off shipment of 1020kg to a wholesaler in WA. all, or virtually all, processes involved in its production or manufacture happened in Australia. Conroys has also undertaken to publish a corrective notice on its website and establish a competition and consumer compliance program. “Many consumers have a preference for products that contain locally sourced ingredients and are often prepared to pay a premium for these products,” ACCC Chairman Rod Sims said. “False claims of this kind not only mislead consumers but can also disadvantage competing suppliers, particularly those who source local ingredients for their products,” Mr Sims said. The undertaking is available on the undertaking register and the infringement notice is available on the infringement notice register.